Do you remember that custom dress I started at the beginning of May? I finished it, May 15th as promised for the event, just as my own life took a turn... and that state of influx I had mentioned came to fruition: I found out that I would be moving to Anchorage, Alaska within 30 days! Needless to say my MMM documenting fell off the radar. Mind you I did keep up with my commitment and am happy to report that I was able to wear me-made garments at least 4 times a week but my photo evidence does not exist as I was spending my free time packing and purging every item I owned. The weekend of May 16 I took an impromptu journey to my hometown in Michigan to say goodbye in anticipation of leaving the Continental U.S. Even with horrid weather I managed a me-made scarf and tee for travel gear. Bonus: during my car travel I was able to finish my UFO pile as per my MMM extra commitment. 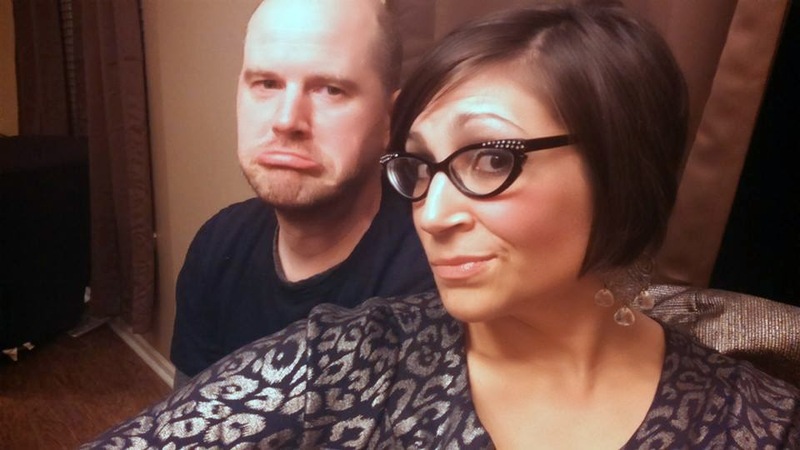 Obligatory sad face pic of me and the BFF; the only MMM pic for the last half of May! I finished and wore the black knit dress (McCall's 6834 - that I was damned and determined to not have become a UFO!) to an amazing party with my Michigan friends. I also had a chance to wear my Burda Jacket as Michigan was still cold. But I didn't manage to capture one good full length pic of the gee golly dress or the jacket. When I returned "home" I had to pack the majority of my sewing space along with all that other unimportant household junk, find my future employment, suitable housing, and negotiate the logistics of this crazy impending move. Because I am restless, I purposefully left my sewing machines and iron unpacked and during my extra time I stitched up another custom dress to surprise my client/friend. We had ordered two different print fabrics to be on the safe side for her event dress. 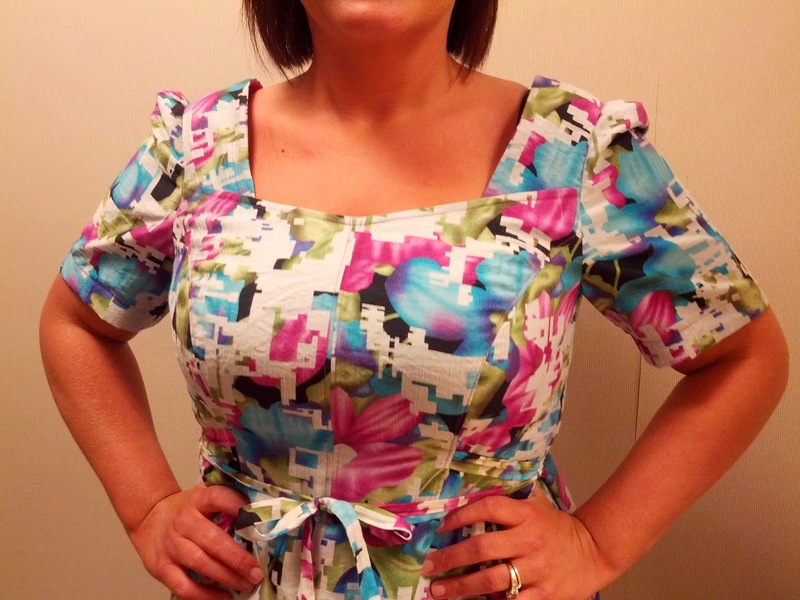 As it turned out both fabrics were fabulous and I knew the second print would be smashing on her. I had her figure adjustments down after the first dress; I did not even have to fit her once for the second dress. It was meant to be! 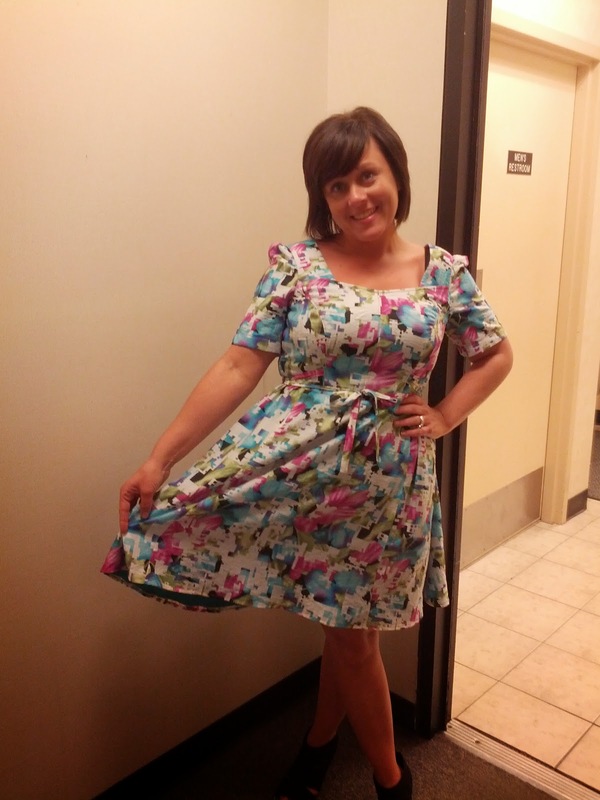 The pattern is Simplicity 1803. The fabric is a very light weight cotton voile and is fully lined. Pattern adjustments: Petite torso and skirt length. Broad back adjustment. Full Bust Adjustment. I stitched up to the last minute! On Saturday, May 31, I finished the hem of the dress at 11 p.m. I then immediately packed my machine and placed the box on the moving truck Sunday morning. It was worth it to see my friends face when I presented the dress to her! Currently I am going stir crazy without the ability to sew however, within 48 hours I will be in route to residing in the great state of Alaska and I can't wait to get back into the swing of sewing! Wow - that's a big change! Good luck and hope you settle in quickly. And there are no fails in mmm - just photos you didn't take! Thank you! Yes, I only failed at the photos! How very exciting! What are you going to be doing in Alaska? Thank you! It's a family move I am transferring my day job. But mostly I will just keep sewing in a different (more remote) location! I cannot even imagine a move to Alaska. You are a brave brave girl! Good luck on your move to Alaska! I look forward to some glamorous Arctic wear. I have missed seeing the things you sew, but the big impact of a move like this is understandable. I wish you all the best, and hope to see you posting your amazing projects again soon! Thanks Vanessa! I promise, I'll be back this is just a little (BIG) life interruption! Sign me up for those Trooper Uniforms! It is exciting, I do not know how well I will fair in the outdoor climate but locked in a warm sewing den I will be just grand. Ooohhh. Congrats. Good luck on the move. I have worked in Anchorage and it is very pretty. Cannot wait to see the wonderful clothes you make in exciting new backdrops. Welcome to Anchorage!!!!! We do have some pretty active sewing groups. Warning....Alaska lacks stores selling a wide range of garment fabric. Thank goodness for the internet! Well good luck with the move and I'm sure you will love setting up your new sewing space. I will be right here waiting to see your first Alaska garment!!! Let us know when you get settled. My sis lived in Fairbanks and mostly liked it (she's quite the outdoorsy type). Here's hoping it's good for you, too! It sound awesome although hectic! Can't wait to see some posts from Alaska! Oh wow, that sounds like an adventure - good luck for your move to Alaska!